Is your marriage troubled? Do you know others in that situation? If so, we hope you’ll find the following to be inspiring. • “There have been more books written about marriages than in all the preceding 2000 years of church history. More books in the last 40 years have been written on marriage. And yet go to any pastor in America; ask him if there aren’t more problems in marriages today than ever before. We’ve got all the ‘how-to’s’ but what we’re missing is the praise of God. Those that pray together stay together. “Even so, there will be difficult moments. I’m not being overly simplistic about this. But God says, ‘Call upon Me and I will answer you. I will show you great and marvelous things‘ —just give Me a chance! • “The God over my life and possibly yours writes, ‘You have not because you ask not.‘ In other words God has this table set for us. And He sees you and your spouse and He knows exactly what you need. He has the table spread with every type of wisdom, grace, and strength you could ever possibly need. But He says the only way you can get it is to pull up to the table. You are to ‘Taste and see that the Lord is good‘ —and pulling up to the table is called PRAYER. Methodology is a TOOL. It’s something that helps you as you work WITH the power of God —because of the power of God —in the strength and wisdom that God can give you through His Holy Spirit. It is not a substitute, or something that has much power without the guidance of the Holy Spirit. We can personally testify that without plugging into the power of God through prayer, our own marriage would be a divorce disaster. Pulling up to the table called PRAYER has been the wisest move we’ve made to save and strengthen our marriage. God is in the miracle-working business. We’ve experienced that personally and have seen it lived out in the lives of countless others. “Take notice of where Jesus did His first miracle—at a wedding. We saw our own personal miracle at our wedding, and we’ve seen a lot since. Maybe your marriage could use a miracle right now. “That day in Cana, there was a change that no man or woman could make. Nobody can change water into wine, but Jesus did. Maybe right now, some change is urgently needed in your home. Have you been to your knees together yet? “Have you poured out your mess, your pain, and your dark feelings to the Lord —crying out together for Jesus’ healing in your marriage? The less you feel like doing it, the more you need to. And if your partner absolutely will not, don’t let that stop you. This passage says Jesus had been INVITED to this wedding, to this marriage. Why don’t you invite Him into your marriage? Did you see that term… hope factors, in what Ron wrote? God specializes in giving hope. And above all, He cares for you. Your marriage miracle may or may not come in the way you hope and pray it will. But don’t lose hope. God still does perform miracles. 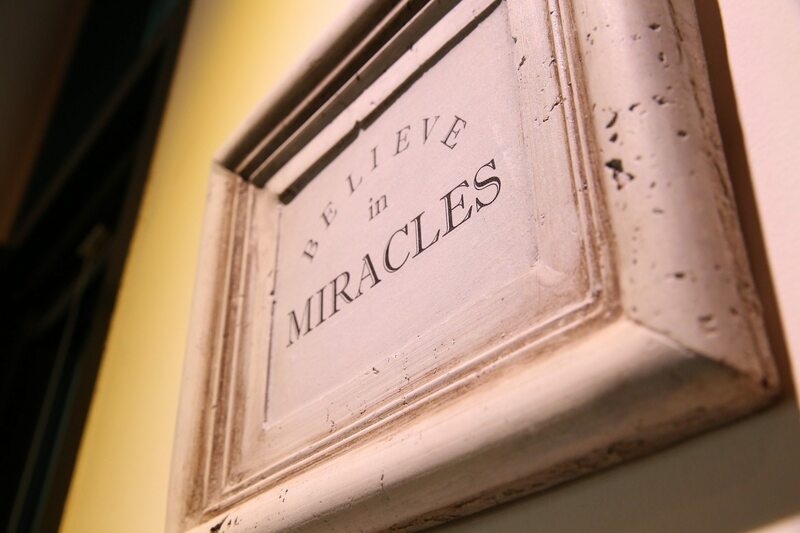 Pray, hope, and look to God to bring a miracle into your life. Just don’t box Him in. Look for a series of small miracles, as well as big ones. And don’t put it into your time frame, but give God the elbow room He needs for whatever amount of time He needs to do what He deems important to do. • “If you’re in a difficult season in your marriage and you start to think, ‘How can I take another 10 or 20 or, God forbid, 30 years of this?’ You’re headed for trouble. You’re asking God to give you the grace for something that hasn’t happened. Instead, break it down to a single unit —a single day: ‘Just focus on this: Can I love my husband [or wife] for this day?’ Don’t think about 10 years down the road, or even 10 months! Can you love your spouse for this one day? You may find it difficult to put your hope into a situation that looks hopeless. But you can put your hope into a God who is able to resurrect the dead? Don’t underestimate all that God can accomplish in your marriage and in your life with one heart fully yielded to Him. Dear Lord, I want to remarry my husband again immediately. My husband and I got divorced because of a troubled marriage. He committed infidelity among verbal abuse and other things. He has come back home for 8 months now. He at first wanted to get remarried but now he doesn’t. I am a family woman, always have been. Please get it in his mind to re-marry me. We have been together for almost 20 years. I love him and I know he loves me. Make all the problems, women, family, friends and anything else go away. Let him propose to me again very soon, like today. AMEN. I pray to you God. Please pray for my marriage. My husband no longer wishes to be married. We have 3 children. I love him. This will destroy our children. Please pray I become the wife he needs. Pray that God opens and softens his heart and gives him the love he needs to continue loving me and staying in this marriage. Myself and my friend are in deep love and we wish to marry. But my parents are not permitting for that marriage and they are making arrangements for another marriage. I am not interested in it. So please pray that some miracle should happen and my parents accept our love and bless us for leading a happy life together. Me and my husband have been together for a year –a year full of lies, cheating, loss of honesty, and hope. I’m 5 months pregnant, I’m separated, and yet I still have hope that our marriage will work. But it’s hard for me to forgive all those times he has cheated, betrayed me, and lied to me. It was more than once. I know I deserve better but I honestly believe God brought us together for a reason. I need a lot of help trusting him. I love him so much and want my family back. Please help me with prayer as I will do the same. My husband left home for his girlfriend. He told me he hated me the last 3 years of our marriage; he also said he had numerous affairs. He has lied so much I can’t trust or believe him. My husband left saying he wasn’t happy. I have anger issues that pushed me away, but I want to work things out. Please get in his head and make him see that he made a mistake. I really love him and can’t live without him. My husband left me after 40 years of marriage for a much younger woman. They have been in a relationship for five years! He filed for divorce two years ago and it will be finalized November 2016. Please God, resurrect this dead marriage. I still love my husband and feel that 40 years are too many to give up on… The addiction he has to her will end soon and they would have destroyed a marriage and ruined lives for generations. I serve a God of second chances and I invite Him into my life and into my marriage. Please get rid of satan, the other women, the demons and soften my husband’s heart. Make him see that we were meant to be. Send him back so we can be complete again. Rekindle the love, passion, intimacy, respect and humility in our marriage. Please stop the divorce and save this marriage. I ask this in Jesus name. Amen.